Alfa Romeo’s range-topping Giulia Quadrifoglio has been awarded the ‘Performance Car of the Year (under £100K)’ gong at Octane Magazine’s prestigious 2017 motoring awards ceremony. The Octane Award judges said: “This is Alfa Romeo back to its brilliant best with a car that’s as good to drive as it is to look at. It’s sensationally fast, yet full of feel and with huge reserves of grip to match the big helpings of power. And when you don’t want to drive fast, it’ll potter around perfectly happily, too – a true, all-round performance car”. Ashley Andrew, Managing Director FCA UK Ltd, collected the award commenting: “The Alfa Romeo Giulia Quadrifoglio has been hailed by many as a five-star car since its debut, but winning ‘Performance Car of the Year’ at the Octane Awards, and to be lauded in such company, demonstrates exactly what Alfa Romeo has managed to achieve. 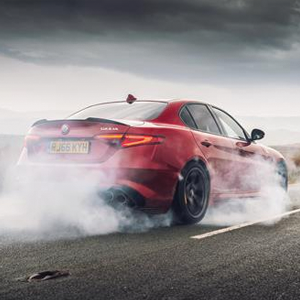 Built with the driver at the core, the Giulia Quadrifoglio embodies a true Alfa Romeo, pairing distinctive Italian style and cutting-edge technology with exceptional dynamic performance”.